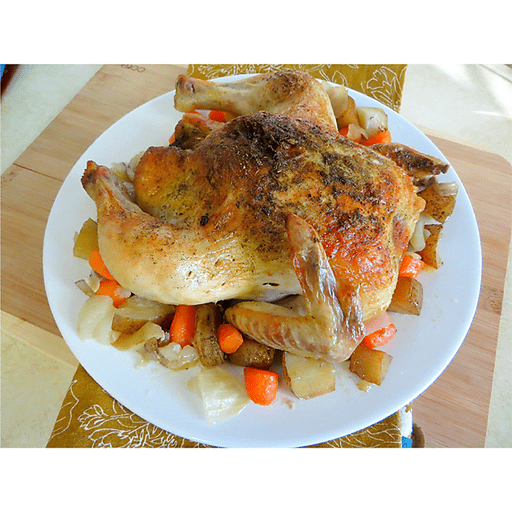 Roast a chicken and vegetables in one pan for a delicious meal and easy clean up! 1. Preheat oven to 425°F. 1. Arrange prepared root vegetables in bottom of roasting pan. 1. Place quartered onion and whole garlic cloves into the cavity of the chicken. 1. Place stuffed chicken, breast-side up, on top of vegetables. Rub the chicken with the canola oil. Sprinkle with garlic powder and poultry seasoning. 1. Roast for about 1 hour or until chicken reaches an internal temperature of 165⁰F in the thickest part of the thigh. Use parsnips, potatoes, carrots, beets and more in this dish. Calories 350, Total Fat 11g (Saturated 3g, Trans 0g), Cholesterol 135mg, Sodium 160mg, Total Carbohydrate 15g (Dietary Fiber 2g, Sugars 4g), Protein 46g, Vitamin A 130%, Vitamin C 10%, Calcium 6%, Iron 15% *Nutritional values are an approximation. Actual nutritional values may vary due to preparation techniques, variations related to suppliers, regional and seasonal differences, or rounding.